I don’t have any tattoos. It’s not that I am unwilling to make the commitment. For a long time I was unable to find artwork that I was really drawn to and ready to bear for my entire lifetime. I was also skeptical that there would be an artist in my area that could maintain the beauty and quality of that artwork when transferring it to my skin. 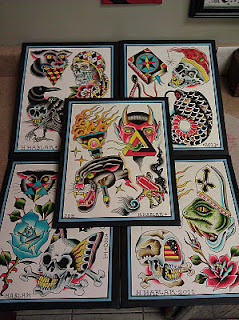 Henry Hablak came into the print shop I work at to get prints made of his flash paintings. I was immediately blown away by his skills. His ability to flawlessly replicate his paintings on the body is incredible – just look at the application of the gypsy in the picture above. Check out his blog, Hardworkingclass, for more pictures of his work.